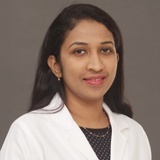 Dr. Honeymol Sebastian completed her M.B.B.S from Government Medical College, Kottayam, Kerala in 2004. PG Diploma in Diabetology 2010 and DLO from RMMCH, Tamilnadu University in 2012. She has more than 10 years of experience as general practitioner. To her credit she has presented at various national conferences and has article published in Indian Journal of Otology. She is a member of Indian Medical Association, KGMOA and AOI. Dr. Honeymol can converse with her patients in English, Hindi, Malayalam, Tamil.